Hannan junior Kevin Morehart, running on the right, approaches home plate to be congratulated by his teammates, following a home run during the Wildcats 19-2 loss to Ironton St. Joseph on Monday in Ashton, W.Va.
ASHTON, W.Va. — The hits just kept coming. 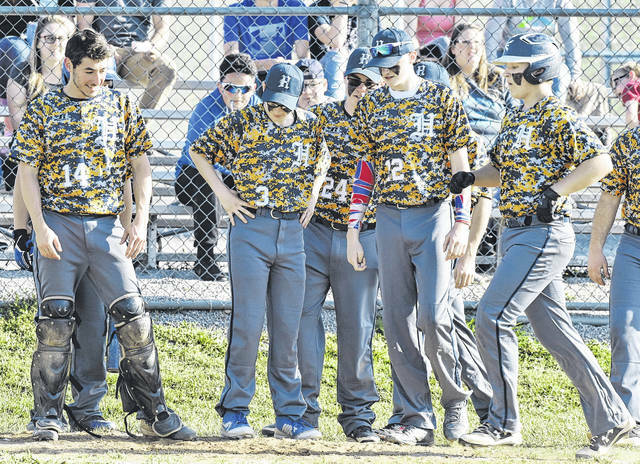 The Hannan baseball team surrendered 21 hits to visiting Ironton St. Joseph, en route to a 19-2 setback on Monday night at the Oshel B. Craigo Athletic Complex in Mason County. The Wildcats (1-7) trailed 5-0 through one inning, as the Flyers (11-3) manufactured five runs on three hits, one walk and an error. ISJ tacked on two additional runs in the second, as Jackson Rowe and Clay Willis each scored in the inning to widen the margin to 7-0. Hannan cut the deficit to 7-1 in the bottom of the second, when Kevin Morehart lifted a solo home run beyond the left field wall. The Flyers further extended their lead to 11-1 in the third, as they sent nine hitters to the plate and collected four runs on four hits, one walk and a fielding miscue by HHS. 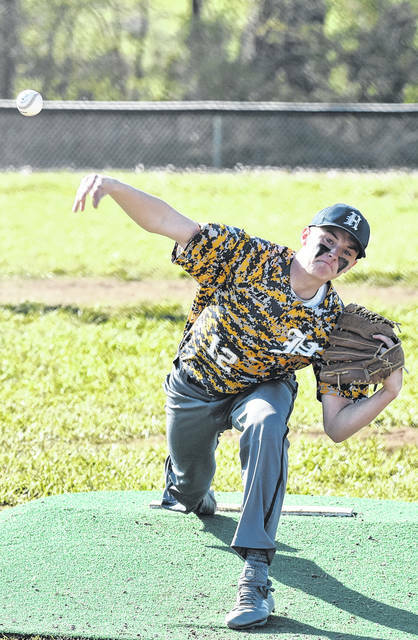 Ironton St. Joseph sent nine batters to the dish again in the fourth, as Rowe, Isaac Whaley, Max Weber and J.C. Damron each scored in the frame to propel the visitors to a 15-1 lead. 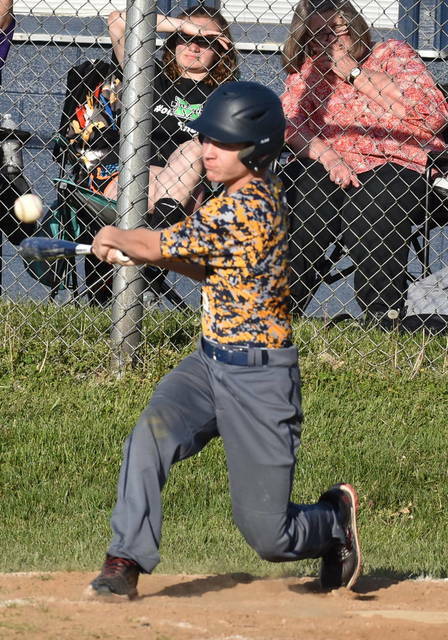 The Wildcats countered with a run in the bottom of the fourth, when Sawyer Casto reached on a one out single and later scored on a single by Morehart to cut the deficit to 15-2. ISJ scored four additional runs in the fifth, while HHS was held without any further runs, to close out the 17-run win in five innings. Matt Qualls suffered the pitching loss for the Blue and White, as he allowed five runs on three hits, with one walk in two-thirds of an inning of work. Morehart provided 1⅓ innings of relief, allowing three runs on six hits, with one walk and one strikeout. Casto pitched 2⅓ innings of relief, surrendering eight runs, nine hits, one walk, while striking out one hitter. Chase Poore also provided two-thirds innings of work, allowing two runs on three hits. Morehart led the way for Hannan at the plate with two hits, including a home run, and finished with two RBI in the contest. Casto finished with one safety and scored once, while Qualls provided one hit to conclude the offensive totals for the Wildcats. Walters was the winning pitcher of record for the Flyers, as he allowed two runs on four hits, while striking out seven hitters in five innings on the mound. Walters also led ISJ at the plate with five hits. Whaley, Rowe and Jimmy Mahlmeister each finished with three safeties apiece. Whaley also scored four runs in the game, while Mahlmeister reached home once. Rowe —who reached base in all five of his plate appearance — scored five runs to lead the Flyers. Weber, Willis and Trae Crabtree followed with two hits each, respectively. Weber also scored twice, while Willis and Crabtree provided one run apiece. Damron finished with one hit and scored two runs to conclude the offensive totals for Ironton St. Joseph. Following the game, HHS coach Sean Coleman was pleased with his team’s effort despite the setback — particularly with their ability to make contact at the plate. Hannan committed all three of the game’s errors. The Wildcats stranded one runner on base, while Ironton St. Joseph left seven. The game also served as Senior Night for the Wildcats, as Casto and Charles Wallace were recognized before the contest. Coleman elaborated on the future of the team and the impact of those players on his ball club.